Thinking about trashing the old pillows, but you just can’t find a new one you like? Fear no more…the Night pillow is here and hopes to knock your socks off. Night is a new company looking to shake up the bedding industry with their new pillow. Will Night restore great sleep? Keep reading below to find out! Want the fast review? Click here to jump on down to the review summary. 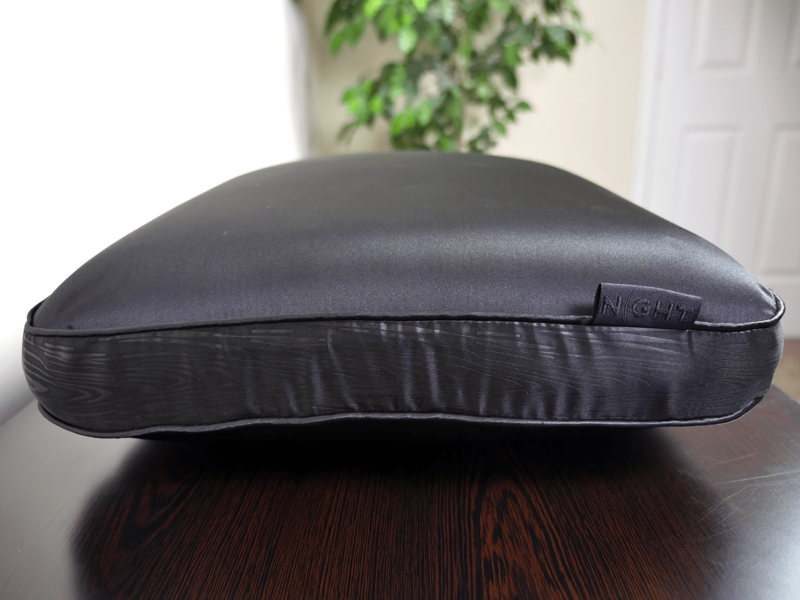 The Night Pillow is made from a memory foam core and a silk / polyester cover. The memory foam core is designed to provide a balanced level of moldability and support. Additionally, this pillow is only offered in a standard size. The cover of the Night pillow is constructed with an inner lining of 100% polyester and an outer lining of silk (95%) and polyester (5%). The pillow also contains a gusset that runs along the perimeter of the pillow. The gusset is made from 100% polyester. Overall, the cover has a tight fit all the way around the pillow and seems to be well made. Night also states that their cover is designed to promote healthy skin and hair. I’m not sure how much better my hair / skin felt after sleeping with the night for many weeks, but the cover does feel extremely nice to lie on. Aesthetically, this pillow is all black and has a wavy lined design running along the gusset. Night took a different route than most pillows today, steering away from the all white design. The all black color scheme gives the pillow a sleek look and personally, I’m a fan. Another small side note, the Night pillow does not need a pillow case because of the cover’s silk materials. Overall, I really enjoyed the feel of the Night pillow. The memory foam core of this pillow is one of the best I have tested to date. Throughout my sleep test I tried to sleep on my stomach, side, and back in order to compare the pillow’s ability to adapt to the change. Night did not disappoint. Night is the first memory foam core pillow that I’ve been able to sleep on on my stomach. Ideally, I would prefer it to be a bit lower, but it is highly moldable, making it a good option. The Night was excellent on my both my side and back. What I like most about this pillow is the relative compact size. I feel like many memory foam core pillows go with the “bigger is better” approach. Having a standard size and modest loft works well for the Night. The memory foam core of this pillow does a great job absorbing the weight of your head and creating a notable contour around your head and neck. This can be a major benefit for those sleepers who are looking to move less during the night, as the ability of the pillow to cradle your head can result in a much more comfortable sleeping experience overall. Although this memory foam core is rounded, there was no feeling as if I was going to roll off of the pillow. There have been times where I slept on a memory foam pillow and the core did not allow me to stay put. Instead, I felt as if I was having to fight the pillow to get comfortable. Night’s deeper sinkage and hug eliminates this feel. Cooling is another bonus with the Night pillow. The silk cover is cool to the touch and allows for consistent breathability. Not once did I feel as if the pillow was retaining heat. In addition, the pillow is only offered in a standard size, which makes it easy to move and mold. A lot of times bigger memory foam pillows can be heavy and hard to move during sleep. The Night pillow is small and light enough to flip over or mold into your favorite position, therefore you are able to adjust and get right back to sleep. Machine washable cover – the cover of the Night pillow is completely removable and is both washer / dryer friendly. Is the Night pillow the right choice for me? 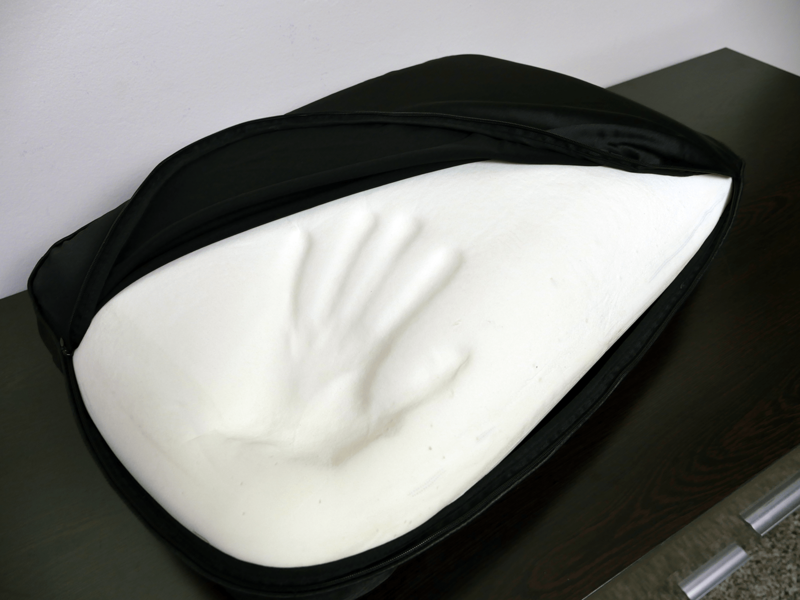 Want a memory foam pillow – made from 100% memory foam, the core of this pillow has a high level of moldability. The pillow does a good job of contouring to your head and neck, relieving pressure. 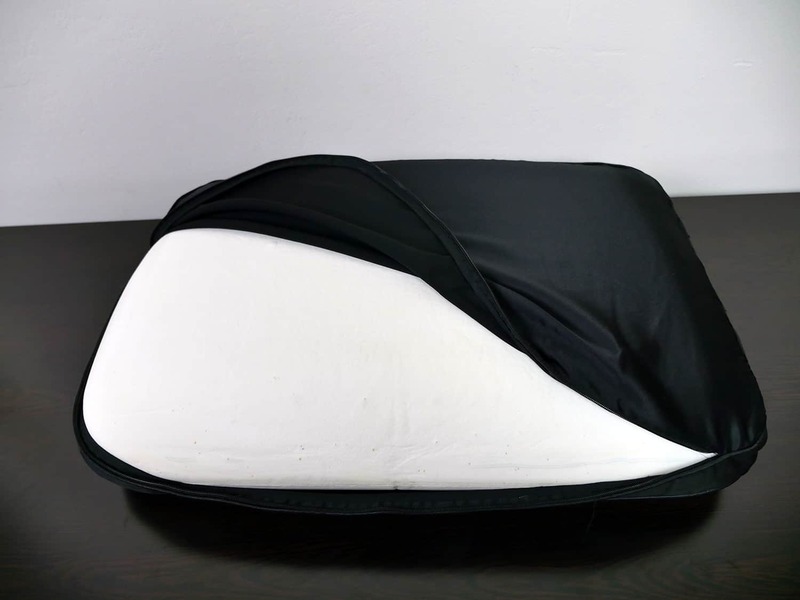 Want a cool, silk cover – with a silk cover, the Night pillow does a good job of maintaining a cooler sleeping surface. The inner lining of the pillow is also 100% polyester, which helps give the cover a snug fit all the way around the pillow. Sleep mainly on your side or back – although sleeping on your stomach is not out of the question with this pillow, side and back sleepers will find this pillow much more comfortable. The pillow will sink a little deeper on your side and back, allowing your spine to remain in constant alignment. However, heavier stomach sleepers (200+ pounds) may find the Night an option. Want more information on the Night pillow or ready to buy? 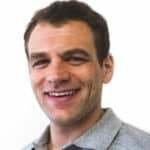 Visit DiscoverNight.com. The Night pillow is unique in its own way. Constructed from a 100% memory foam core and a silk / polyester cover, this pillow is both moldable and cool. Side and back sleepers, along with heavier stomach sleepers, with thoroughly enjoy this pillow. The medium loft and standard size make it easily moldable and movable during the night. Overall, Night did a great job giving this pillow a modern look and luxurious feel.